A closer in view of this section of the trip. 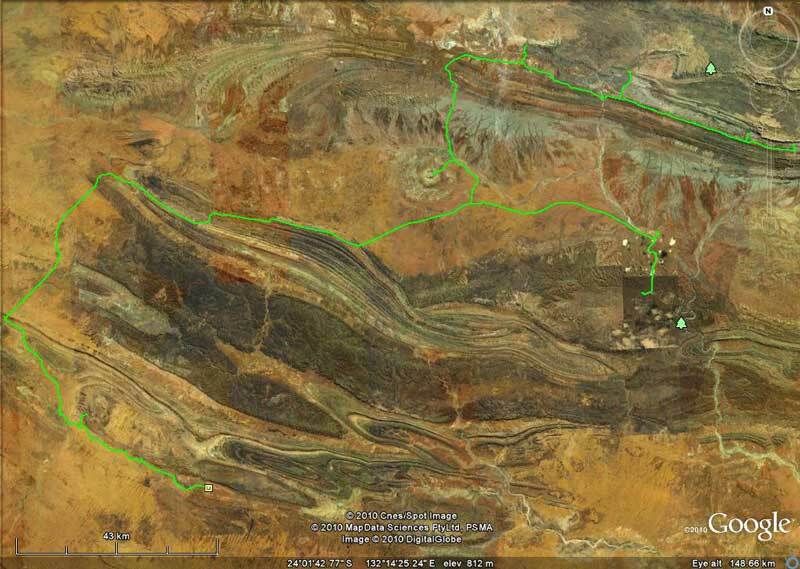 Ellery Creek Big Hole at top right of track and Kings Creek Station bottom right. the circle of rocks at the end of the short track middle top. Flies! Lots of flies! It was very warm last night and at 7:30 am it is already almost 20ºC. The warm night must have brought them all out. At 8:30 am, Kelly and I move the car to the day use area as we are doing the Dolomite Walk. 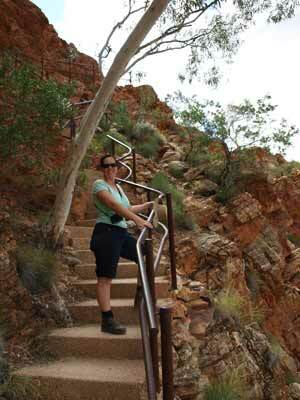 This goes to the west along a section of the Larapinta Trail and then over to a creek and back to Ellery Creek. It is said to be three kilometres and one or one and a half hours (depends where you look) but it only takes us 50 minutes. It is a very easy walk, with some nice things to see. 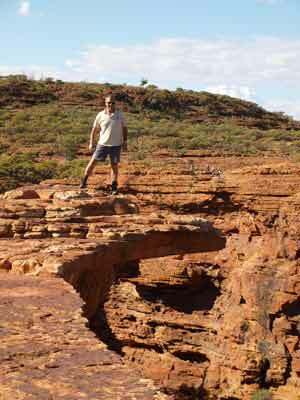 After this, Tomas and Peter F join us and we walk to Ellery Creek Big Hole. This is another gorge, this time with a pool that totally blocks access to the other side. This is very easy. Once back at the cars we leave. It is 9:50 am. 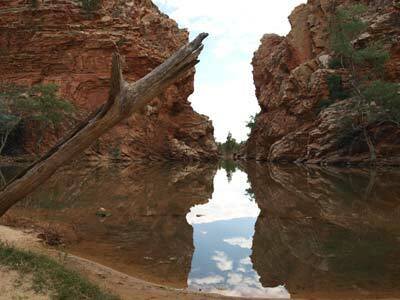 At 10:05 am we arrive at Serpentine Gorge. The last five kilometres off the main road is pretty rough. We do the 1.3 kilometre walk to the gorge. Again, another stunning gorge. It takes 40 minutes to do the return trip, including some sightseeing. Back at the car we have morning tea and then leave at 11:10 am. 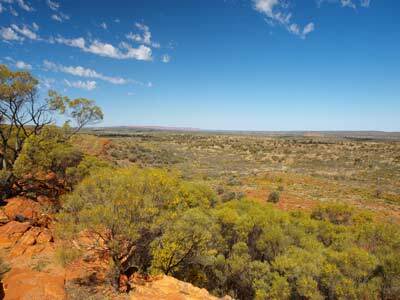 About 15 kilometres along there is a sign to a picnic area called Neil Hargraves Lookout which has a radio tower. 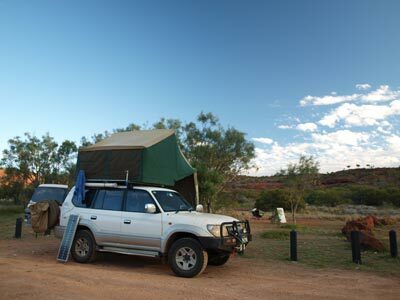 This has some nice camping sites (you can stay 24 hours) and there are a couple of caravans here. However, in last night's wind I would not have liked to be here in a tent. 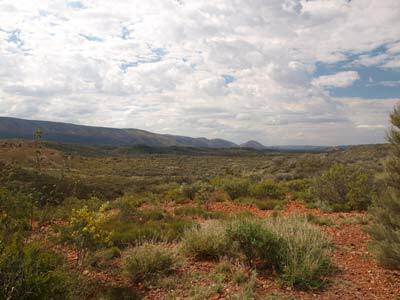 There are views back towards Alice Springs. 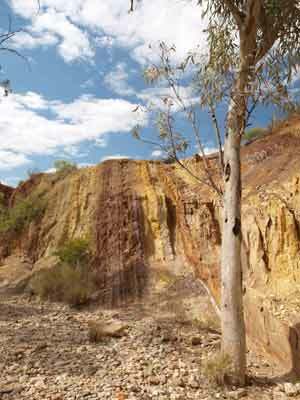 Six kilometres along we come to the Ochre Pits. We get here at 11:33 am. 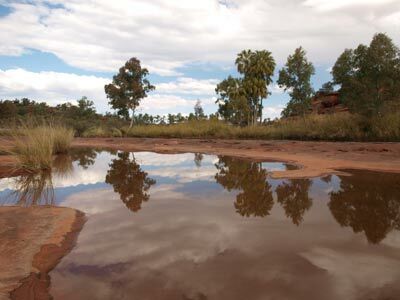 This is where the local Aborigines obtained different colour pigments/mud for their ceremonies and medicine. It is worth stopping to see the colours. We leave at 11:55 am. 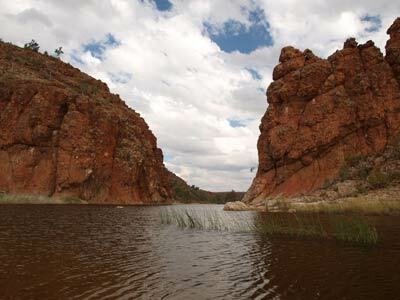 Another 18 kilometres brings us to the Ormiston Gorge turn. It is seven kilometres to the gorge and there is a camping area here. One look shows that we would probably not like it here, too many people and too close together. We arrive at the parking area at 12:15 pm and do the 10 minute walk to the gorge. There is lots of water in the gorge. 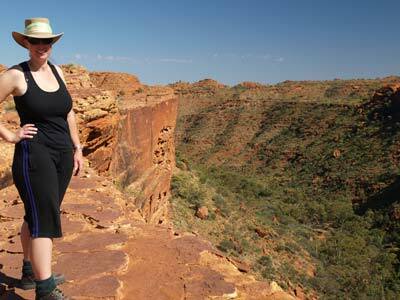 After this, Kelly and I did the first part of the Ghost Gum Walk. This goes to a lookout platform that hangs over the gorge. It is reasonably hard, but only a short distance. It takes us 12 minutes to get there. The views are spectacular! I strongly recommend you do this walk. Back at the car, we have lunch under one of the shelters. It is quite warm now, 27ºC. We leave at 1:40 pm and head to Helen Gorge. 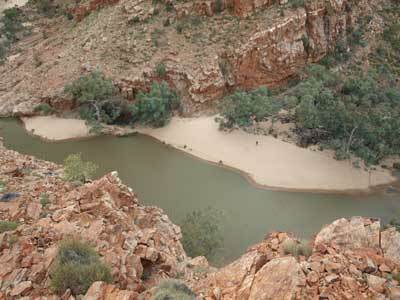 This is only four kilometres further on from the Ormiston Gorge turn off. This is probably the least spectacular gorge in the West McDonnells, but it has a resort (of sorts - pretty basic looking). 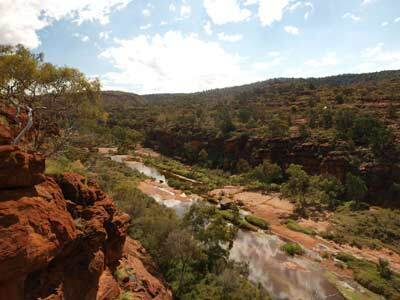 We purchase a Merrenie Loop Pass ($3) which we need to access the road from Hermansburg to Kings Canyon in two days time. 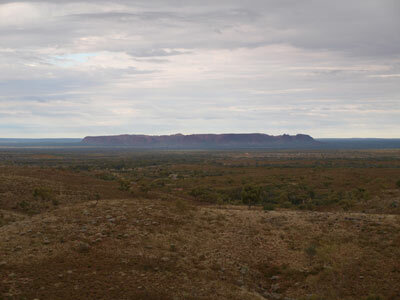 The road is through Aboriginal land. I am not sure why they bother, as the cost of administering the sale and the small brochure they give you must be close to the $3. 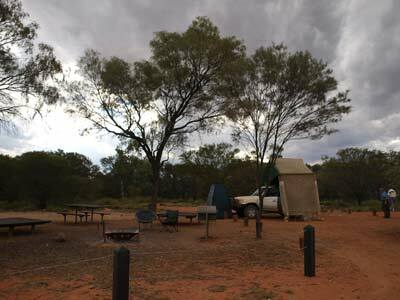 We leave just after 2:20 pm and 300 metres down the road, just before the Finke River, is the turn off to a very little publicised camping area called Two Mile. This is on the eastern side of the river and runs for some distance (Two Miles?) to the north. We check it out and it looks quite good. We push on and a few hundred metres the other side of the river is a short track to the Mount Sonder Lookout. 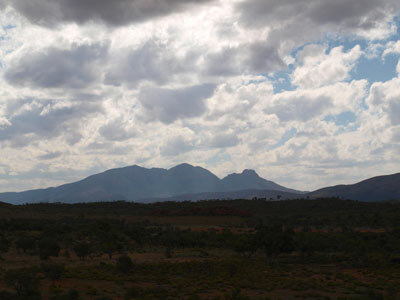 This gives good views to Mt Sonder, the highest point in Central Australia. We are back on our way at 2:40 pm and at 2:55 pm we reach the Redbank Gorge turn off. Three kilometres along is the access track to the Woodland Camping Area. We check this out and find it is pretty good. We select the spots we would like to use. We plan to travel to the the gorge and also look at the other camping area before making our decision where to camp. 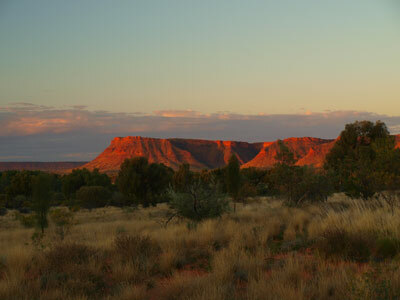 Two kilometres further into the park is Ridgetop Camping Area. This is located, as the name suggests, on the top of a ridge. As it is very windy, this will not be a good place to camp tonight. However, if there was not much wind, it would be a good spot. There are fireplaces and toilets, perhaps space for six cars. 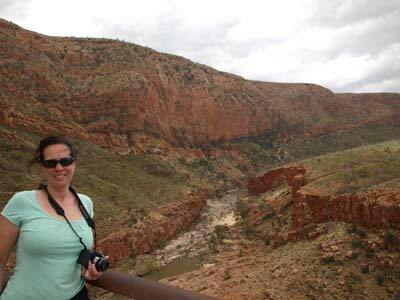 We continue onto the gorge and one kilometre along we come to Redbank Gorge. It is 3:05 pm. We all do the walk. It is said to take one and a half hours to do the walk but we comfortably do it in 45 minutes. It is a nice easy walk, with a good gorge to view at the end. We decide to go back to Woodland Camping Area. We pick out site 9 and set up camp. There are 13 sites, each with its own gas barbecue, low table/seat and a fireplace. The gas barbecues also have gas burners for pots/kettles. There is also a toilet. Our site has enough space for at least three cars and lots of tents. We set up camp, the ground is extemely hard and we have problems putting our tent pegs in the ground. It is windy so we need to make sure they will not move. We end up using some large rocks to hold the wall of our Shippshape in place. I set up the hot shower and most of us have the first shower in a few days. It is good to be clean again! We have the usual drinks and nibblies and Kelly starts on a beef stroganoff. This is very good. We go to bed earlier than normal at 8:30 pm as we are quite tired from all the walking we have done today. At 10:50 pm it started to rain. For 10 minutes it was quite heavy. It rained two more times, only lightly and for a short time and at 3:10 am it rained for 40 minutes, some of it quite heavy, some light. We get up at 7:20 am and it is quite wet all over. It rains again as we put the tents away. We leave at 8:25 am and at the main road turn right for Hermansburg. 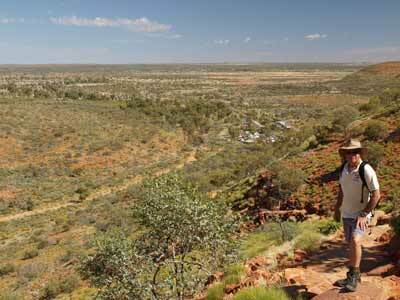 At 8:50 am we stop at Tylers Pass Lookout which has excellent views of the Gosse Bluff meteor crater. There are picnic tables here as well. It is still overcast and sprinkling, a bit warmer at 17.5ºC. We leave at 9:02 am and at 9:17 am we take the road to Gosse Bluff. The road into the crater is quite rough and the going is slow. We reach the picnic area six kilometres away 13 minutes later. This is an average of only 28 km/h. the walks here are unmarked. There is a loop walk that goes to a small mound that gives a good 360º of the crater. It then continues on to the north and there is a short climb to a hill that has even better views. Why are there no signs???? We have morning tea after this and then leave at 10:10 am. 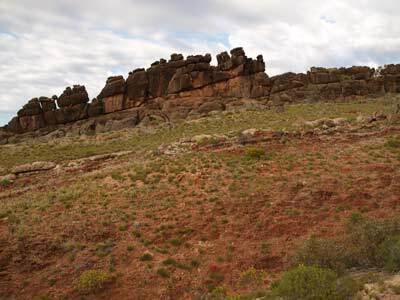 At 11:04 am we are nearing Hermansburg and see a sign pointing to Albert Namatajira's House. We drive down the track to find an old house. However, there is no other interpretative signs so unless you know who he is, then what is the point (he was a famous Aboriginal painter). 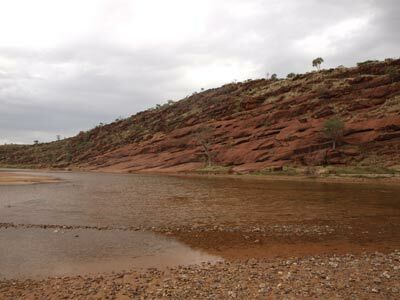 At 11:13 am we cross the Finke River. The road is quite corrugated to here. The causeway across the river has been damaged by the floods earlier in the year. Three minutes later we arrive at Hermansburg. I had not planned to visit here but Tomas has seen an article in a leaflet advertised apple strudel at a cafe there. 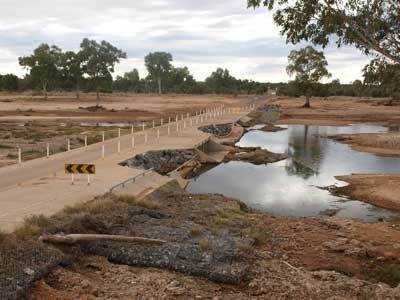 The Finke River causeway with extensive flood damage Water in the Finke River - rare! We drive into Hermansburg. The caravan park is closed, the shops not much, junk everywhere. The cafe is part of the historic precinct, the old Lutheran mission. We drive in, only intending to have a coffee and strudel. The very rude operators demand $10 entry per person even though we tell them that we do not want to look at the mission buildings, just have a coffee. There is no way we are paying $18 or so for a coffee and strudel, so we walk out. They chase us demanding $10. The next lot of people coming in are also treated quite rudely. Avoid this place like the plague. 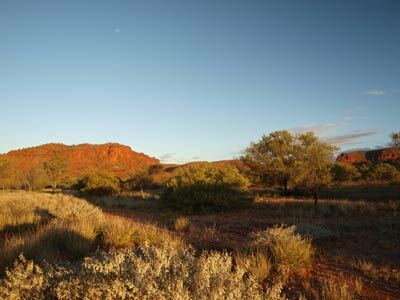 We head back towards the Finke River. At the turn-off to Palm Valley, we stop and have morning tea. It is 11:36 am. The others arrive a few minutes later and we head off. 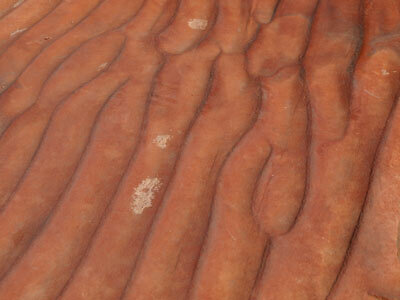 This is a very rough track, with lots of corrugations and sandy spots. We stop to cut some firewood and continue on. It takes about 45 minutes of actual driving to cover the 20 kilometres (average just under 28 km/h) and we arrive at the camping area at 12:45 pm. 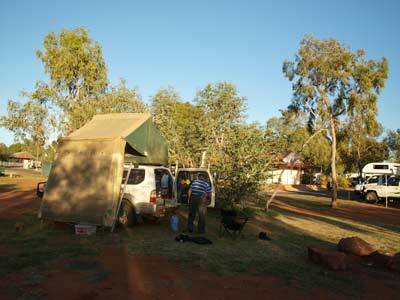 This is an excellent camping area, probably the best you will encounter in a national park in the Northern Territory. There are flush toilets and hot showers as well as fireplaces, gas barbecues, tables and some cover. We pick out our spot and Tomas and Peter F set up their tents. As Kelly and I cannot do this, we take our chairs and tables and block off the site we want. We have lunch and then head off to do the longer walk at Palm Valley itself. Tomas and Peter will follow later as they are only doing the shorter walk. The track to the start of the walks is definitely 4WD only. 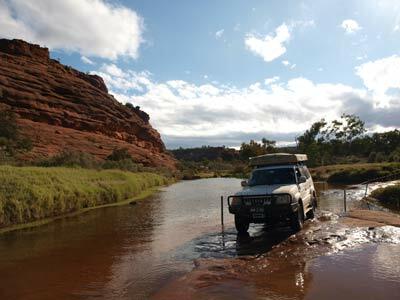 It goes though soft sand and over very rough rock platforms and through water. It takes about 20 minutes to drive the four kilometres, an average of about 12 km/h. We set off on the Mpulungkinya Walk which is said to be five kilometres and take two hours. 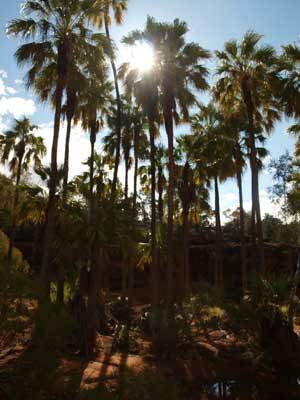 It is an easy walk which goes up over the ridge to the south of the car park to Palm Creek. 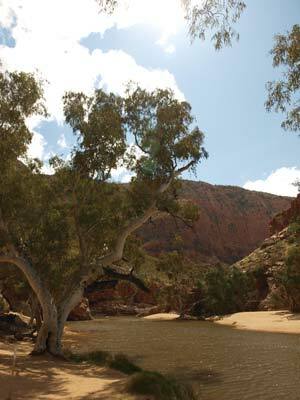 This is the creek that runs through Palm Valley and past the camping area and eventually into the Finke River. 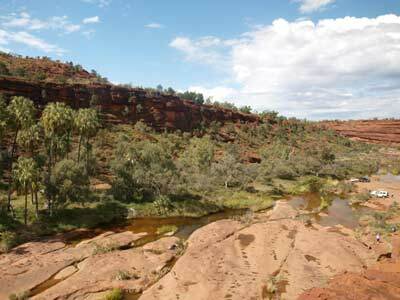 There is also a shorter version of this walk that follows the actual Finke Gorge and returns along the creek. The views as you climb the ridge are very good and as you descend into the Palm Creek valley even better. 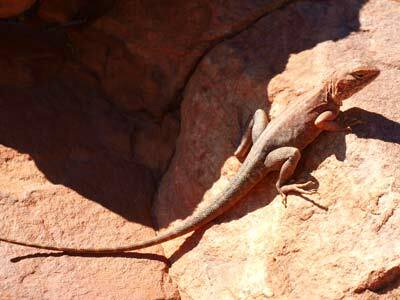 We see lots of wild flowers and some small lizards. The walk along the creek bed is brilliant. The water is still running from the recent rains and this makes it even better. When we get closer to the main walk, we come to a section that is blocked by water. I squeeze along a tiny ledge out of the water but it is only with luck that I do not tumble into the water. Kelly decides to take off her shoes and walk through, much more sensible. We get back into the main gorge and see where the shorter walk comes down a set of stairs. Most people either do this walk or just walk up the valley. A bit further along we come across Peter F and Tomas who are doing the valley walk only. 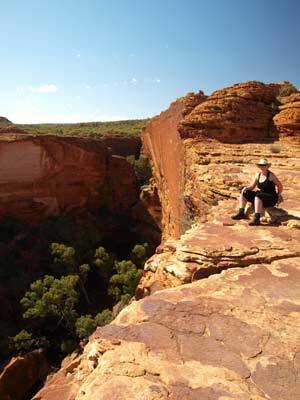 Peter tells us he has seen a rock wallaby but it has taken off. Towards the end of the walk I find two more up on the cliff face to the south. We get back to the parking area at 3:40 pm, the walk having taken 100 minutes (including many stops for photos and relaxation). We drive back to the camping area, arriving at 4:15 pm. Once we have set up the roof-top tent, I immediately start the fire as we are having a roast dinner. We then head off and have a well earned shower. A beer and nibblies follows, very relaxing. Meanwhile, Peter pulls off his roof rack as he has some loose bolts that he cannot tighten. This takes him the rest of the afternoon. Dinner is roast pork with vegetables and followed by my crusty apple pudding with sultanas (well, we did not get the apple strudel at Hermansburg). We go to bed at 9:30 pm and read for a while. We are up at 8 am and have breakfast. Kelly and I do the walk from the camping area to Kalarranga Lookout. You can also do this from a car park nearer to it. It takes 50 minutes return and is easy. 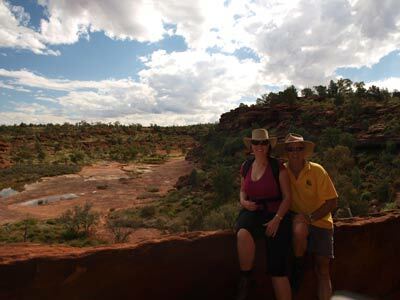 There are great views to the south as well as over the whole section of Palm Valley and off to the Finke River. We depart the camping area at 10 am and within a minute we hear Peter T on the radio. We soon run into him. 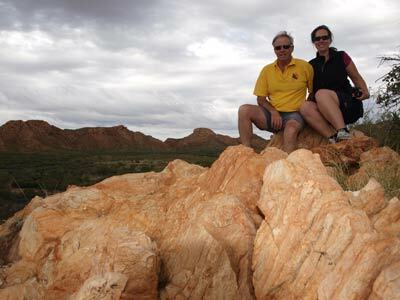 He had left Alice Springs yesterday with his wife Elly and the kids Melanie and Keith. 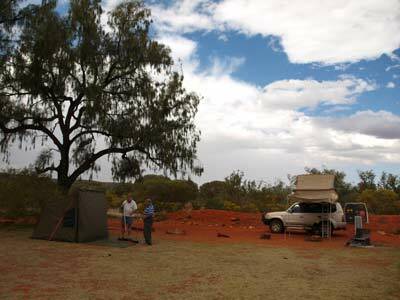 They had tried to stay at the Hermansburg caravan park only to find it shut down. 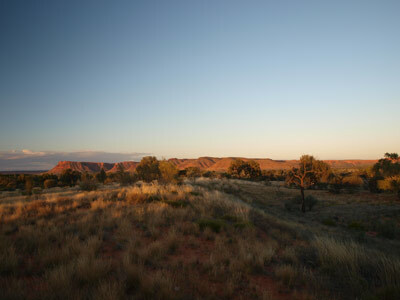 They had headed on towards Palm Valley but at the first crossing of the Finke River, they decided to camp there rather than continue in the dark. 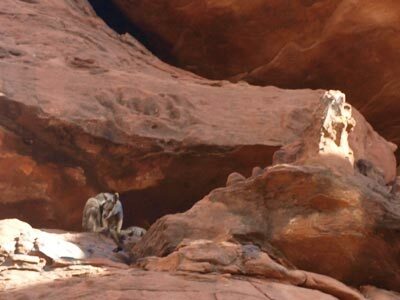 They will go into Palm Valley and meet us tonight at Kings Canyon. We continue on and head west along the Merrenie Loop Road. As mentioned a few days ago, you need a permit to travel this road (as it is Aboriginal land) but nowhere do we see any signs stating this. The road is through some very spectacular countryside. We pass though Kapatata Gap between Mount Kapatata and Pine Point and then parallel to the Gardiner Range. We cross over a couple of the ranges (which are like ridges running north-west to south-east) and eventually around the last remnants of it. At 11:25 am we stop in a creek bed for morning tea. I complete sharpening the chainsaw. The mulga out here is so hard it blunts the chain after only one use. We then cut some timber for firewood for tomorrow night (fires are not permitted at Kings Canyon Resort). We are back on the road at 11:50 am. 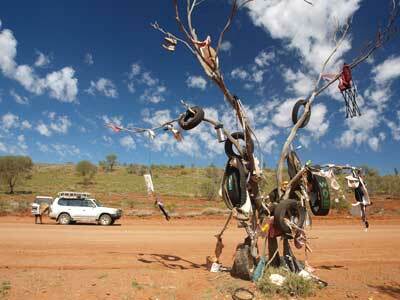 At 12:45 pm we come across a "tyre tree". This dead tree has lots of tyres on it as well as other things. Kelly adorns it with an old occy strap as well as a St George Scuba Club sticker. We only spend 10 minutes here and at 1:17 pm we stop for lunch. We leave at 1:33 pm. At 2:23 pm we stop at a lookout. This is just before you drop from the plateau into Morris Pass and Hope Valley. There are quite good views from here (and you could camp here as well but you are not supposed to). We leave 2:30 pm and drop via the hairpin turns into the valley. It is only 28 kilometres from here to Kings Canyon Resort and we arrive there at 2:55 pm. We book in ($17 per person) and find a spot. This is not a really well set out camping area, with powered sites jammed in together and the unpowered sites all over the place. Once we have erected the Shippshape, I go for a walk to check out the place as I want to watch the sunset and I cannot recall where the boardwalk starts. Once back at the car, Kelly and I read till 5:15 pm when we go off for a shower. There is a happy hour at the bar from 6 pm so we all head up there. While we were showering, another car with a Shippshape set up near us. As we walk past the owner calls us over and has a chat. It turns out the Shippshape is his daughters and he wants to ask about our ladder as the one that came with it is a tubular design and hard to climb. He has purchased a folding ladder and is using that. We grab a beer and sit outside. Very relaxing. We get another and walk to the sunset area as sunset is 6:28 pm. It is nice but not spectacular. We go back to the bar and end up deciding to have dinner there in the Outback Bistro. I have emu, camel and kangaroo sausages with mash and gravy, $21. A few more drinks follow and we see Peter T finally arrive. We take Melanie and Keith into the bistro while Peter and Elly book in. We end up back at the camping area at an unknown time and after some discussions with an Italian couple and their kids who are set up next to Peter T, we head off to bed. Although we are not travelling far today, we have a long walk to do and we want to complete it in the cool of the morning. We are up at 7:30 am and leave by 8:25 am. 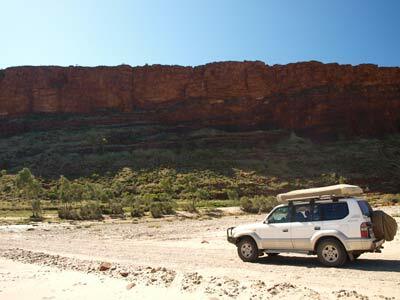 It is only 12 kilometres to the Kings Canyon car park. Peter F and Tomas have set off before us and have already started the walk when we arrive. We follow at 8:40 am and soon see them ahead of us. The first part of the walk is quite steep and relative hard, although if you take your time most should be able to do it. The first 30 minutes are the hard bit, with quite a few stops required. Kelly and I soon pass Peter and Tomas and we continue on alone. After the climb the walk flattens out and moves behind some rocks for a bit. Eventually you come out nearer the cliff edge. 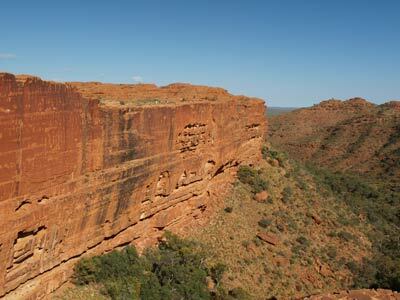 There is a side diversion to Cotterills Lookout that we do. This is not far, only 300 metres or so, and gives some of the most spectacular views of the whole walk. The walk then cuts over to the canyon where it becomes a gorge. There are some steps that take you down to a bridge and then more steps that take you up the other side. Quite easy. 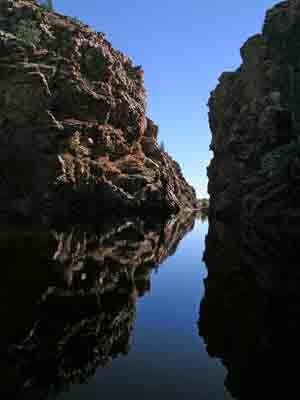 You can also go to the Garden of Eden which is the gorge bottom at the intersection of the head of the canyon and the gorge. The track then goes over to the other side of the canyon. There are also spectacular views from here. after this the track moves away from the canyon and comes down via the next valley. This really is one of the best walks you can ever do. Even if you only do one walk on your trip, make it this one. 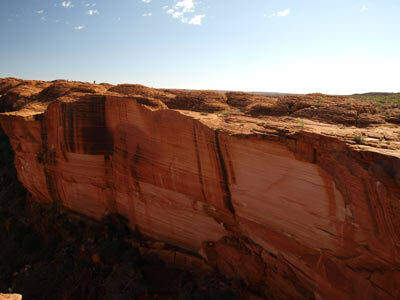 The walk is said to be 5.6 kilometres long and take three to four hours. Kelly and I did it in 2.75 hours with lots of stops for photos, snacks and rests on the hard section. Kelly's Dad, Tomas, who is 67 years old with crook knees, did it easily in just over 3.5 hours. Make sure you take lots of water as well as some snacks. By the time we finished it was very hot, perhaps 26ºC. 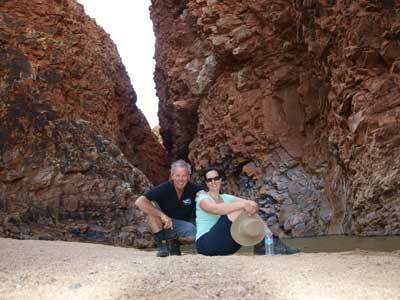 After completing this walk, Kelly and I did the Kings Creek Walk. 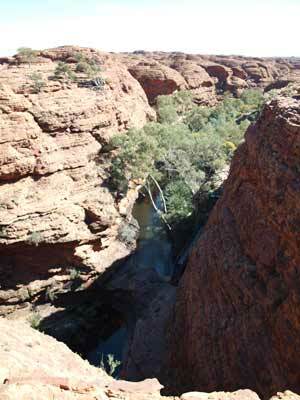 This follows the creek up the floor of the canyon. It is flat and very easy. The walk is said to be 2.6 kilometres and to take one hour, but we did it in 40 minutes. An annoying fact about this was that at the end of the walk there were three very drunk males. 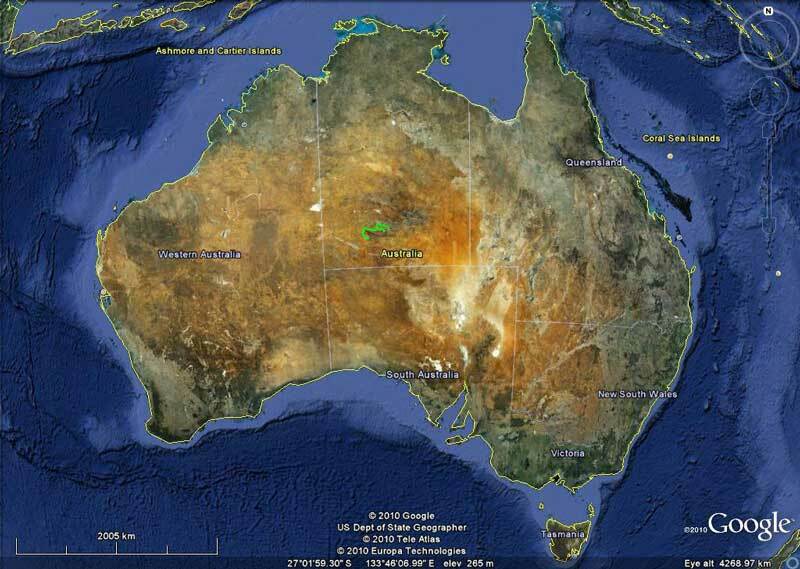 They were two white fellas and an Aboriginal all on holidays from Alice Springs. They never stopped swearing the whole time we were there. We were unfortunate enough to run into them many more times over the next few days, and every time they were full, no matter the time of day. By the time we returned to the car it was about 12:30 pm so we drive to the picnic area and have lunch. We leave at 1 pm and at 1:25 pm we arrive at Kathleen Springs. I had thought that the springs were close to the picnic area but it is a one and a half hour return walk. We decide not to do the walk as we are all quite tired. We instead find a shelter and lay on the bench and rest or read books. 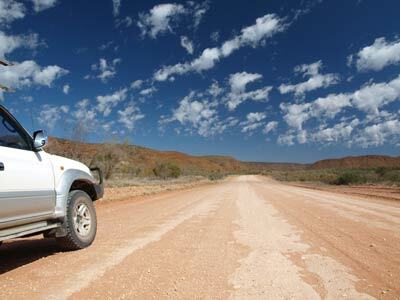 At 2:25 pm we decide to leave and head for Kings Creek Station. We get there at 2:45 pm and book in. The price is $17 per person, the same as the resort. In 2003 it was considerably cheaper than the resort. By coincidence, we get allocated to the same camping area as 2003, the Top Oaks. This is the pick of the sites as far as I am concerned. We set up camp and then rest and read again. Towards 4 pm there are some sprinkles of rain and it is looking very dark to the west. At 5:30 pm Kelly and I walk to the bar/bistro to purchase some apple strudels for dessert. We also decide to have a beer, Hahn Super Dry in skinny cans, something we have never seen before. As we do this it starts to pour. It buckets down for 10 minutes. We walk back to the camping area and find that all our chairs are wet even though they were under cover. The wind was blowing so much everything got wet. I start a fire and dry out our chairs. Kelly is cooking chicken and leak with a cheese sauce and rice. At about 7 pm Peter T and family arrives. 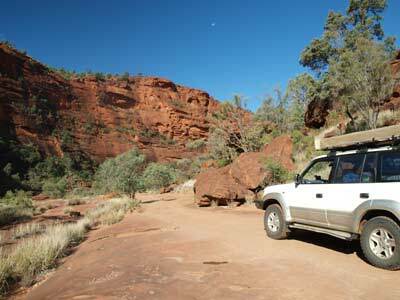 I never do figure out where they have been since lunch time as we saw their car at Kings Canyon when we left. The Federal Election was held today and I have a listen to the results. As we go to bed at 9 pm it looks like it will be a hung Parliament, with neither side getting a majority. This is indeed the case and it was not till 8 September 2010 that the result was decided. We read till 9:30 pm. It looks like it will rain.